Rough-legged Hawks are just 1 of 3 hawk species in the U.S. with feathers reaching all the way to their toes, an adaptation for life in cold climates. 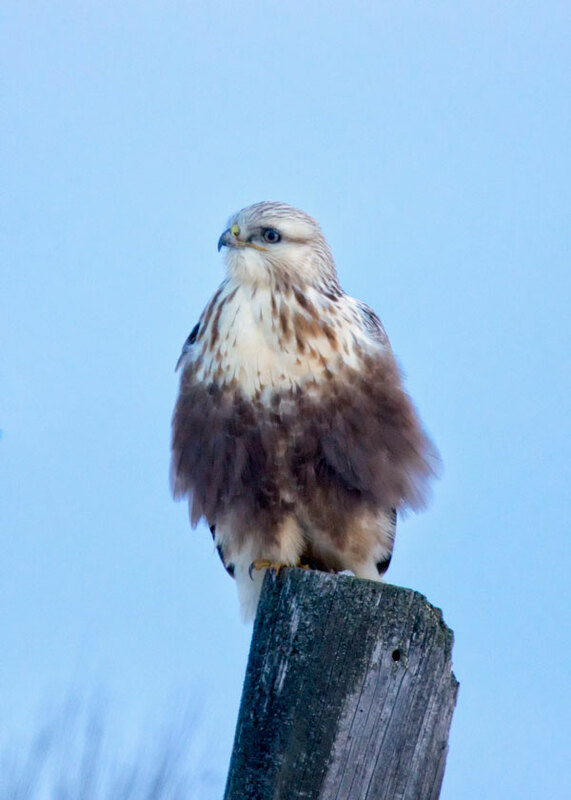 The Rough-legged hawk is a large, long-winged, long-tailed hawk; with the females being larger than males. 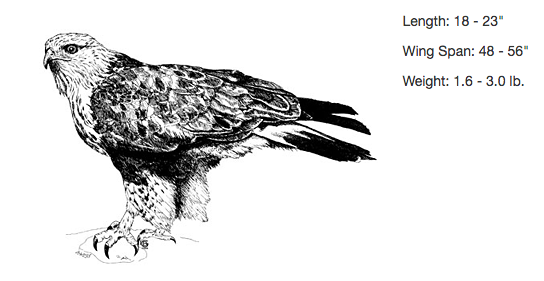 The Latin name Buteo lagopus means "rabbit-footed," as the legs are feathered completely down to the small yellow feet. These birds feature lots of dark coloring throughout their feathers with a white underside. The pattern and amount of dark coloring is extremely variable in this species. Flight is active with slow, flexible wingbeats; soars in a medium dihedral (v-shaped attitude of wings), and hovers frequently. One of the most approachable roughies I was able to capture. Habitat: Open country; breeds on Arctic tundra and mixed tundra / boreal forest. 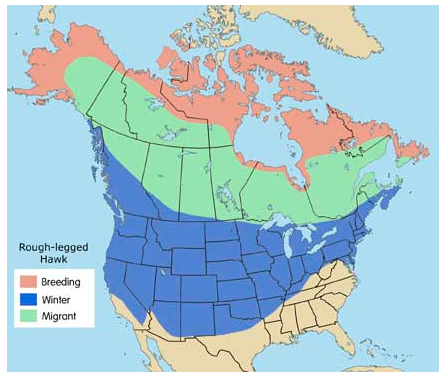 Whole population moves south in winter, keeping to open farmland, marshes, other open areas; often migrates in large flocks, arriving in early to mid - autumn; are settled in winter territories across the U.S. from November to March. Often roosts communally in winter, usually in conifers. Diet: Small to medium sized mammals. Hunts in open areas from a low perch or elevated spot; frequently hover-hunts. May be found in same area and eat the same food as Red-tailed Hawks, but avoids direct contact and competition with that species by hunting from lower perches, keeping more to open areas, and using a less sedentary hunting style. Call: Soft, plaintive courting whistle in breeding season; alarm call is a loud screech or squeal, or a drawn-out, descending, whistled kee-eeer.